The first-person shooter is admittedly not my favorite genre. It needs to be a specific type of FPS for me to really dig into it, one with a feel for an arena-based shooting experience, and one with a campaign that isn't linear. TimeSplitters 2 is both of these things, and it makes for a well reviewed game as you'll see with this review of mine. My favorite first-person shooter of all time is Perfect Dark. True to its name, the game offered a perfect mix of solo play and multiplayer options, a healthy heap of content, and a presentation that was jaw-dropping for the time, even if now, the game plays more like a slideshow thanks to the sporadic frame-rate. 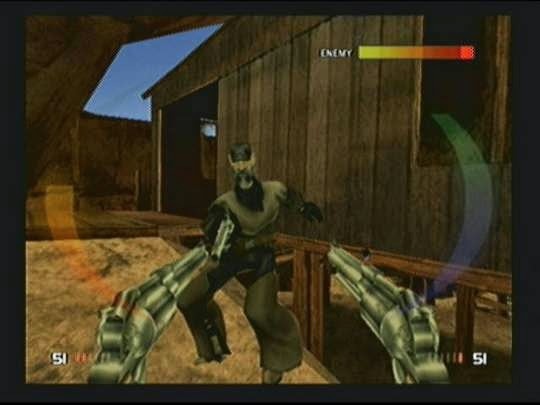 Fifteen months before the game was set to release on the Nintendo 64 back in 2000, a portion of the development team packed up and left to create a new studio, Free Radical Design. 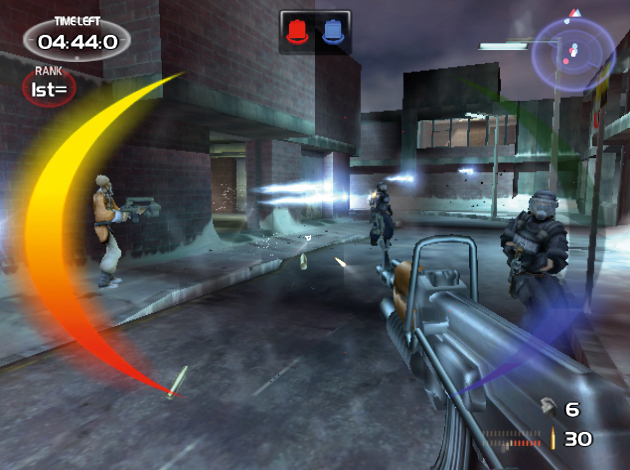 The team, made up of notable members like David Doak, Steve Ellis, and Graeme Norgate, released TimeSplitters on the PlayStation 2 as their first completed project. 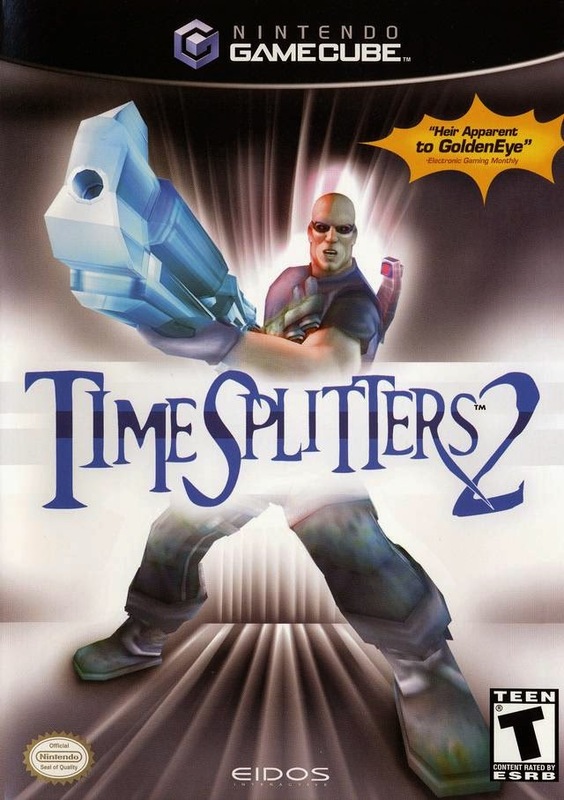 As soon as development for that game was finished and the game launched to high fanfare, the team then turned its attention to the sequel, TimeSplitters 2, this time arriving on two more platforms, Microsoft's Xbox and the Nintendo GameCube. Amassing a hefty load of content and acclaimed first-person shooting action, TimeSplitters 2 seemed like a game I should have played a long time ago, just based on the credentials of the team alone. It turns out that TimeSplitters 2 is the Perfect Dark heir that I had been waiting to play for over a decade now. Sergeant Cortez and Corporal Hart, two space marines, arrive at a space station that is infested with TimeSplitters, an alien race that wants nothing more than to see the demise of humanity. 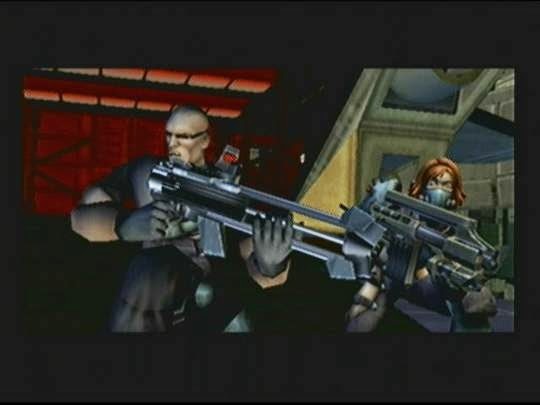 Using special objects called Time Crystals, the TimeSplitters are entering several periods of time to change the course of history to humanity's dismay. It's up to Sergeant Cortez to leap into the time portal, take on personas related to the various time periods he enters a la Quantum Leap, and stop the plans of the TimeSplitters before they can do irreparable damage to history and humanity. This is all the while Corporal Hart fends off the TimeSplitters trying to reach the portal room. wipe out the TimeSplitter menace! TimeSplitters 2's story is fragmented thanks to the different personas Sergeant Cortex assumes. The game is most definitely not a story-driven one, which makes it quite easy to not care about the characters or plot whatsoever. You get a text briefing at the start of each mission, but at the same time, you don't fully become aware of why you're doing some primary and secondary objectives, making for some questions on why you, the player, should be invested in this fight. place in a futuristic Tokyo. There are three difficulties to choose from for each of TimeSplitters 2's ten missions. Regardless of which difficulty you pick, each mission has to played in order. Missions are relatively short in Easy mode, whereas with Normal mode, you get to explore more of the levels with more objectives that are required to complete to beat a mission. In Easy and Normal, you get an ample amount of body armor and the ability to reach checkpoints that are helpful spots that you restart at if you are to fail your mission or die prematurely. Hard mode doesn't give you the benefit of checkpoints, and truth be told, some missions are very challenging even on Normal. In fact, the first, Siberia, is one of the harder missions in the game due to its length and lack of more than one checkpoint. It's here that I realized that TimeSplitters 2's difficulty curve was more of a roller coaster than a straight uphill climb. but there's also no honor in dying on the first mission! Outside of the story mode-- which is other than the inconsistent difficulty curve, well designed and offers an awesome ability to play cooperatively with another player-- there are a multitude of other modes to tackle by your lonesome. The Arcade League mode presents you with a varying amount of league difficulties, Amateur, Honorary, and Elite, and have you competing in different themed skirmishes in one of TimeSplitters 2's fifteen multiplayer arenas. Depending on how well you do, you earn one of three medal types and unlock new in-game content like cheats, as well as new multiplayer maps, modes, and characters. all up close and personal! Challenge mode has you taking on a profusion of different scenarios with the goal of trying to meet the requirements, whether a time limit or a score for the best medal. These come in different categories like stealth, shooting galleries, survival, and a several others, giving you plenty of types of scenarios to select from. Both Arcade League and Challenge deliver a massive amount of more gameplay styles and content for solo players. It's immensely rewarding to gain medals to unlock new, unexpected content that would otherwise be hidden away from the player. The fact that with all of this single player gameplay I haven't yet mentioned how the multiplayer half of TimeSplitters 2 plays is really saying something to just how packed the game is with things to do. One gun against two? Are you cocky or dumb? Only four modes are available in multiplayer matches at first: Deathmatch, Team Deathmatch, Capture the Bag (a Capture the Flag variant), and BagTag, where a player must hold onto to the bag as long as possible to score points. As Arena League battles are completed, new modes open up-- one of twelve others, offering a grand variety of match types. 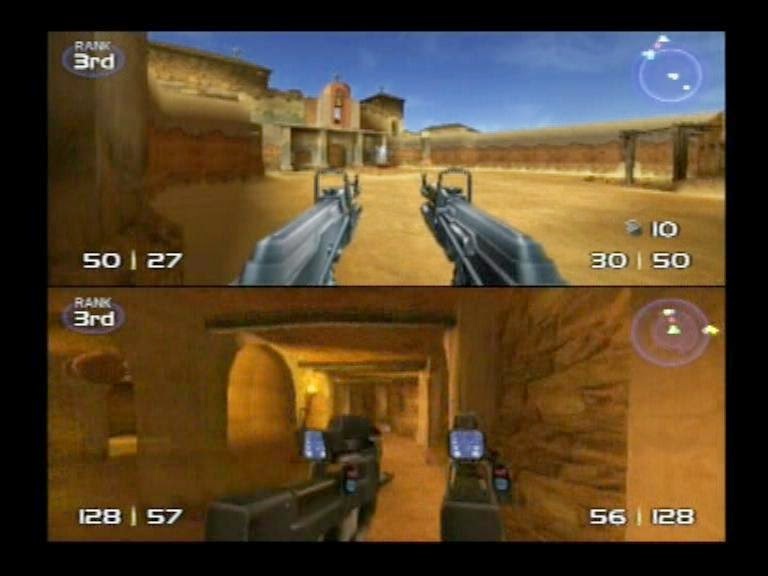 and fun multiplayer maps in TimeSplitters 2. 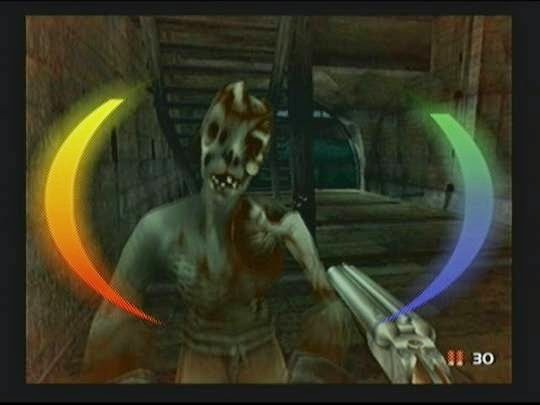 The multiplayer in TimeSplitters 2 is an absolute blast, offering a robust amount of match options to fiddle with, allowing you to create the match types you want to a shocking degree of customization. Bots are here and allow for full rooms, making matches fun if you are by your lonesome or have three other friends to frag. Maps are well designed, allow you to choose from a set of bots, weapons to use, and options like one-hit kills, if players begin with weapons, and a multitude of other customization features. unlocks by beating the game. In addition to the multiplayer maps already provided in TimeSplitters 2, a returning feature from the original TS is the Mapmaker, now with even more creation tools to allow you to make your own multiplayer maps and even single player missions. With helpful and accessible tools, level kits, and more, you can create a competent map with your own character and weapon spawn points, lighting, and so on. 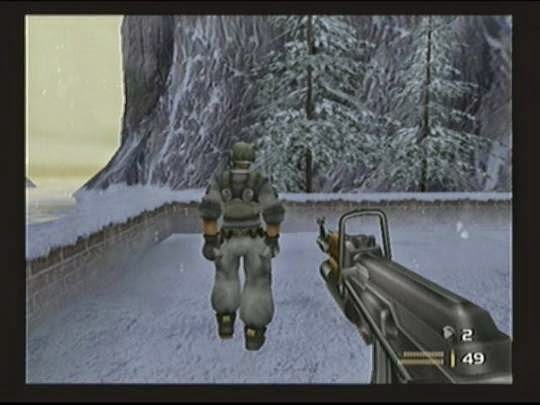 Like the some of the team's past work on GoldenEye 007 and Perfect Dark, TimeSplitters 2 delivers in offering awesome weaponry to mow down enemies and the competition with. 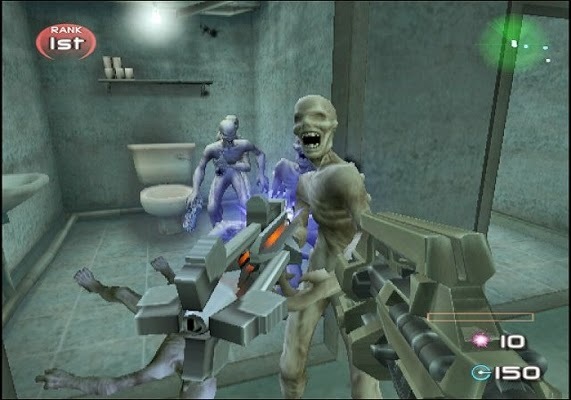 From old school weapons like Tommy Guns and silenced pistols to futuristic weaponry like homing rockets and guns with bullets that bounce off walls, floors, and ceilings, TimeSplitters 2 gives you the offensive goods to tackle any challenge or obstacle the game throws at you with relative ease. At the very least, you'll feel like a one-man or one-woman army, even if you quickly die to your opponents. the restroom at the moment. 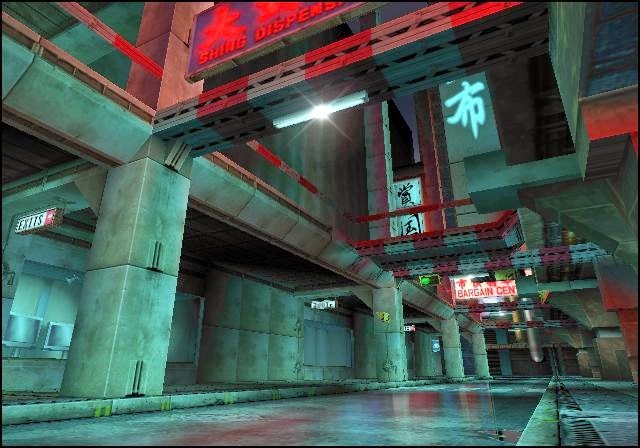 While the design of human characters leaves a little to be desired, the settings and areas of TimeSplitters 2 look fabulous and have an intricate amount of detail to them for a sixth-generation game. 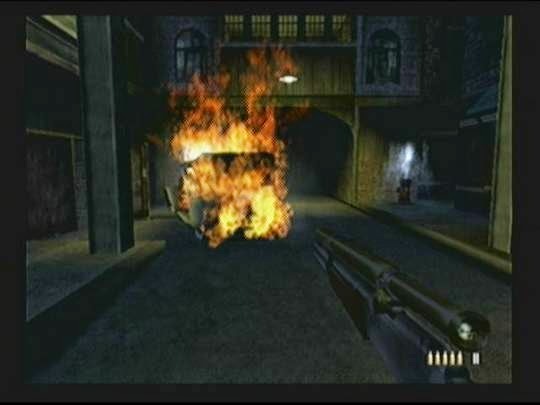 From nice effects to rain droplets blurring the periphery of your view in the Notre Dame mission to intense flames in other levels, there are some lovely effects thrown in to TimeSplitters 2's presentation. Fortunately, unlike Perfect Dark on the Nintendo 64, the frame-rate is your friend in Free Radical Design's second offering of TimeSplitters. Better call your State Farm agent for this one. Graeme Norgate delivers a techno at some times, dynamically symphonic at others, score to accompany the many hours of missions and multiplayer fragging that await you. The voice work, despite being attached to characters I found no interest for, is performed adequately and believably. This is indeed a presentation for TimeSplitters 2 that is as engaging as the gunplay-- that is to say, very good. TimeSplitters 2 may not offer the online play that most of us expect from a first-person shooter today, but the ability to play with bots of varying difficulties makes for a nice replacement-- but not totally. You'll easily get your money's worth from the solo content of the game alone, much more with multiplayer throwing in one of a dozen match types, one of sixteen well-designed multiplayer maps, and an abundance of characters to unlock. TimeSplitters 2 is now one of my favorite FPS games of all time, and it makes the thirst to play the other games in the series like the thirst of walking a desert for days without water. As you kids growing up in the eighth generation of video game consoles would say, "I needs me some more TimeSplitters!"